Iyer, sy tau, mentang² la adik sy nak kawen, dan² la sy asyik jumpe lagu jiwang² hahah..
Actually, I heard this song a few years back when I ws still a loyal listener of Mix.FM. Around the time I started switching to FlyFM (sbb time tu Mix byk sgt iklan and Fly sgt kurang iklan, tp kini suda terbalik hehe..) I heard this song.. So, rasenye ini jugak termasuk dlm soundtrack kawen Ayu yg ntah bile itu.. boley? 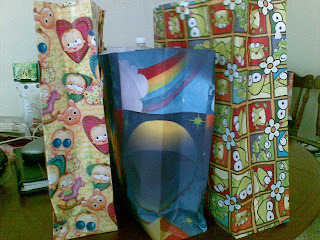 Of 'poyo'ness and 'ciwi'ness.. and "Ayu tanak kawen"?!?! I came to school early today.. then cabut back home haha.. I've still got tonnes to do regarding the spring cleaning and somehow, I can't just start-->stop! I keep stopping every now and then haha.. sungguh teruk! 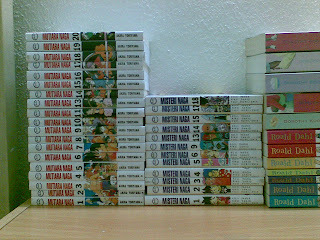 Among the people yg wajib ku MMS bende alah itu are Misa and Amoi la, my gang pengumpul komik satu zaman dolu. Misa seperti ku agak, akan jeles hehe.. jgn risau Misa, ni sy kumpul balik ni. Sy idak le terre nyimpan collection yg lame time kite kumpul dulu. 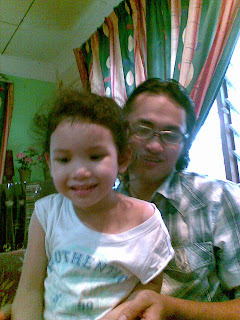 Udah ilang dibuat dek adik² ku sob²..
Cikgu Amoi plak, sbb dah abis time skolah, rajin la dia melayan my sms. We were talking about our 'dream' dulu nak kumpul all the comics and figurines and make a special place for it in our own libraries. She told me she was lucky since her husband also liked collecting these comics so he didn't mind her buying them. I told her, I wish I'd find someone like that since I don't wanna throw them all away again. "Sy ingat lagi masa sek awak ckp xnak kawin, tp nak bby. Hehe kelakar kan.."
Aiyak! Did I say THAT out loud dulu?!?! "Ye lah. byk kali plak tu. Sbb tu sy ingat.."
Alaaaa.. mule la nostalgia ingt time sekolah²..
Last night stayed up again, but this time more to clearing up my bedroom since terdapat sgt byk habuk ditinggalkan oleh rak² di dalam bilik :D Left me sneezing tp padan la muke kan, sape suh sapu je selame ni hehe..
..and uwaaaaaaaaaaaa! Now my bedroom seem so bare, its almost depressing! My bedroom used to be my safe haven. I had my bed (of course! ), my closet, my study desk, my pc desk and my 3 book racks. 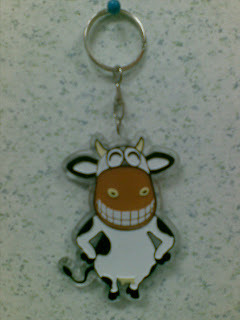 I could stay locked up in the room without going out and still survive (klau tak makan laaa..). Last night, after mopping up the room, beating the mat (bamboo one but still need beating sbb somehow it still berabuk) and rearranging my colourful boxes in place of my book rack, I realized my room was almost HALF EMPTY! Now I'm trying to figure out apekah yg perlu ditambah so my room doesn't seem so.. empty! Huh! Tidoq sorg pun nak tamak katil besau ke? Baju awak byk sgt ke Ayu? Anyway, as for the room hehe.. Since I haven't bought new book shelves, I just stacked my books up lah dulu. 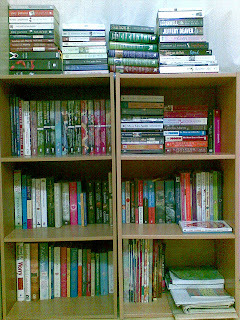 Like this..
Hehe, was patting myself on the back around 4.30am this morning, happy that I've already moved all the books in my so-called study. ..until I arrived at the living room. Kunun nak wind down tgk CD jap laaa..
Aiyakkk! Konpem gonna hafta go buy at least some simple colour boxes this weekend..
Got this from kak Jah who got them from the Dean, Prof Hamidi who just came back from the project in Makkah :) Semangat kak Jah nak bg different flavours for me to taste hehe.. Yesterday was the 1st phase of turning the backroom into my study. I didn't stop til nearly 5am and by then, I was so tired.. not sleepy, but tired. Took a bath before crashing on the living room settee and only woke up when Leong called. Anyway, while doing the 'tranferring', I noticed something I've quite forgotten. 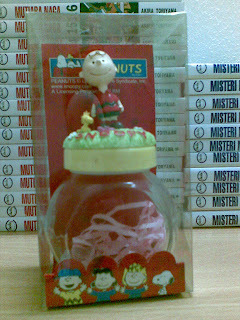 Its something I used to collect when I was smaller. 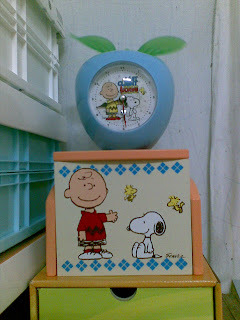 You remember the cartoon Peanuts? 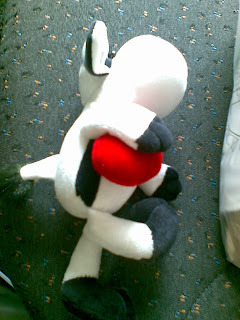 Or maybe some of you prefer SNOOPY? Hehe..
Back to Adi. On my 19th birthday (I think! 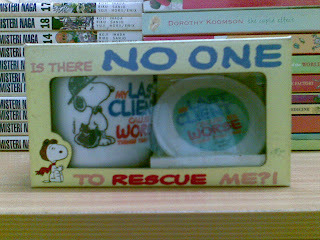 ), after he realized I was a bit upset seeing my Snoopy thingeys lost, he bought me this..
Then another year, I found this @Watsons for a Snoopy promotion they did..
..and ni paling suke. Went to Popular a few years back and found these. Padehal time tu bukan ade duit, tp sbb takut lain kali dtg dah takde, sanggup ikat perut berminggu haha.. Tak silap they were priced at RM35.90 each and though mase ni I wasn't a school girl with a RM2 daily allowance, I still wasn't in shape to buy anything I wanted, whenever I wanted. Tp beli jugak tuh hehe..
..not PhD-wise, may I warn you! 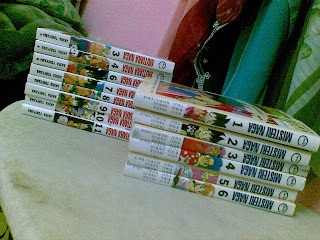 Hehe..
And on my first purchase, I bought these..
Yeay! Hehe.. also planning to buy the figures I saw in SnJ. I've now been living alone for, what? One year? To tell you the truth, I now prefer living alone. Except for that scare I had at the end of last year when someone came knocking at my bedroom window at 3.30am and the unwanted-four-legged-guest I had a few months ago, I think I'm comfy. Only one problem: I have TOO much space! Adehhhh! The house has three comfortable-sized rooms. I've used one room as my bedroom eversince the days I lived with kak Kt and kak Shima so I have another two rooms to spare. The middle room is now my so-called walk in closet haha.. No! I don't have that much clothes but this is the only room without windows so I can hang clothes without worrying they would fade from the sun. I've put the ironing board and all linen in this room. I've also put a clothes rack for my baju kurungs and blouses, all hanged neatly(?) with hangers.. I've also put my tudung rack here. And all my perfumes (I just realized that I collect a lot of these.. tp bukan la yg mahal² punye :p Just the usual Body Shop and Victoria Secret ones), body lotions, lip gloss (yg cume pakai di pagi hari.. and klau ilang, ilang laaa.. no touch up for me :p) bla bla bla..
.. and just so it doesn't look like I'm taking so much space. I've also put the spare matress here along with an extra towel rack for visitors. I know, why don't I put it in the third room kan? I feel its not only too much of a hassle untuk jage 2 bilik camtu, but also coz the room would seem so bare.. just a matress and towel rack?! The third room pulak has been bare eversince my last housemate moved back to her hometown. I've always kept the door closed as I hate seeing the empty room actually.. and jugak sbb she left the room without cleaning it up properly AND with a broken cupboard (which is the land lord punye) Sakit ati tul.. 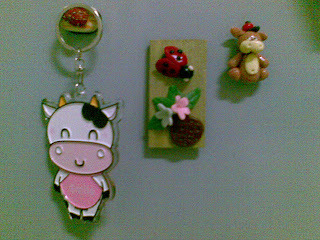 The cupboard asalnye in my room but since I had my own furniture, we moved it to the middle room for kak Kt.. and then I moved it to her room when the middle room became empty and I realized she didn't have anything to put her clothes in. 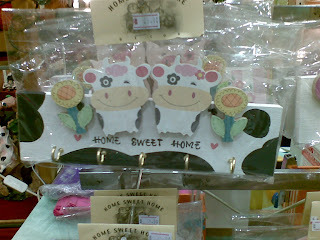 I'm pretty sure I gave it to her in a good condition BUT she left with the door tercabut from its hinges.. leceh tul la! Anyway, not-exactly-recently, I noticed my overflowing books. 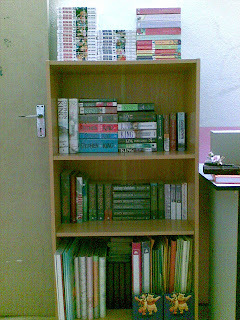 Now that my book racks in my bedroom pun dah penuh, I've resorted to double-stacking my books in the current racks and also stacking some books on the floor in the living room.. and believe me, those stacks are growing taller every month. 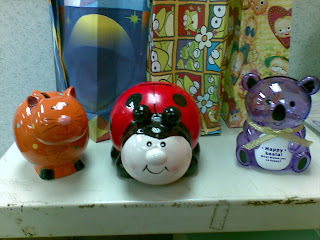 Pastu pulak, now that its nearly the middle of the year, I also remembered something else. Usually bile dah dekat time pekse, I'll be having students asking for additional private tutoring. Besenye budak form 3 lah ni. I do it for free for them, provided they come to my house la kan. The reason, klau buat additional private tutoring at the tuition centre, the 'boss' nnt suh budak² ni bayar and not all of them can afford additional costs kan. Anyway, whenever they come, I could only offer the dinning room table for studying. Mmg was thinking of the third room, but I don't have extra tables ke whatsoever.. However, since I'm growing sick of seeing this empty room, I think I'm gonna change it into my mini library and study room.. aci tak? Hahah.. since I'm staying alone pun, I think itu tak jadi masalah, betul tak? ..and the challenge is to turn the room into something useful! 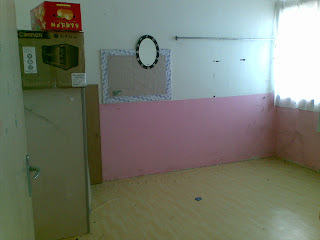 I'm gonna move my pc (yg dah tak berape bergune excpet for men gem jek hehe..) and current study desk in my bedroom here. 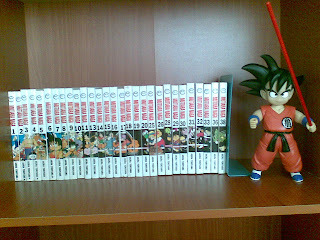 Gonna have to buy some book shelves jugak la kan. Then maybe nak find those Japanese-kind low tables.. 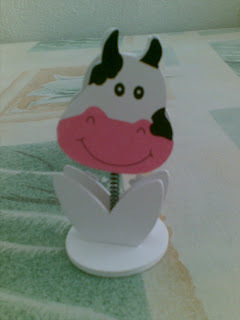 Seems like evesince I wrote about my lembu affair, ade je bende baru I nak tunjuk hehe.. 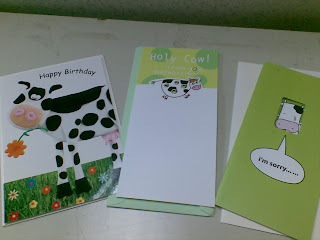 Yesterday got a few new things but 1st I wanna show this..
..collection of lembu cards. 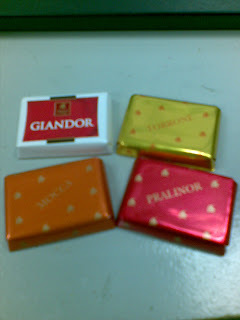 Iyer, sy tau, ade 3 je, ape kes hahah.. One from Ad and the 21 one from Bai. 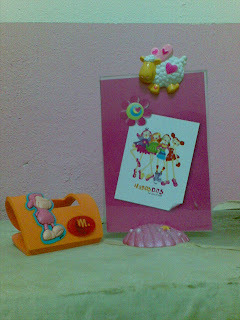 The 'Sorry' one from Wamlah.. chumel kan heheh..
Then this one plak a note/card holder bought @QB. Was walking ngan Bai and saw this. could imagine her rolling her eyes tp dilayankan je Ayu nak benti 'tengok je' before Ayu beli trus. Huh, mesti si Sentot ni kate, "Ayu ni tadak willpower langsung!" Hehe..
Pastu plak, went to Memory Lane, my wajib lawat store hehe.. Bai bought some cards for her anniversary AND friends wedding (Pasal kawen aje..) and I stumbled upon this..
Waaaahhh, suke! Tp konpem tak bg sape pinjam. 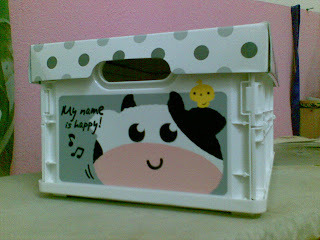 Its white maaa, nnt kotor camne (Dasar kemut! Abis tu awk beli buat pe, Ayu?!?!) 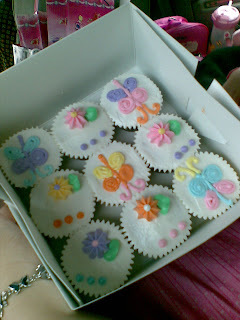 Yesterday dah testing², sangaaaat lembut heheh.. Suke giler! ALSO! I got another birthday suprise heheh..
Was hungry and Bai belanja me for lunch at Paddingtons! Yeay, dah lame ngidam nak makan sini and I took some pancakes with dory and mashed potatoes.. yummy! Silap la tak amik gambaq coz I was too hungry time ni :"> Len kali lah ekk.. So Adi and Ana, hands off! 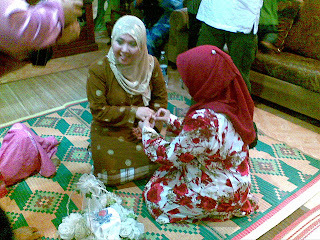 Lagu ni I dah chup utk time I kawen, wpun tatau bile kaaaaan hahah.. Sile pilih lagu lain utk kenduri korg ye :p <--Ikut ckp kakak!! Heheh..
Was more nervous than Adi n Ana ke sy ni haha.. but I WAS afraid if I didn't wake up since I'm the sleep-late-on-holidays type of person so I didn't dare to sleep. Passed the time by making sardine rolls (1st time, babe! 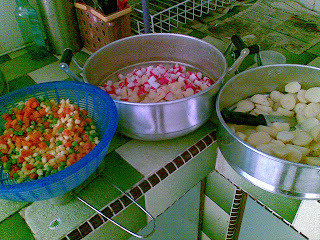 Haha.. lupe nak amik gambo la pulaaakkk..) and crabstick sandwiches. Then nganga jap din know what to do hehe.. Right after Subuh, trus head to Abah's as that was our meeting point. Yg bes tu, I was yg jauh sekali, but I was the only one yg dah siap at that point.. 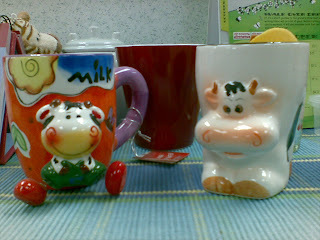 chaiitt!! Anyway, dah kul 9 kot baru bertolak. Around noon sampai kat tmpt Izati to pick her up and her things. Then went to Adi's to pick him up, baru la gi umah Ana. Sampai umah Ana dah kul 3pm. Malu je laahhh.. Sampai je trus makan the yummy lunch prepared by her family.. serius sedap hehe.. then after memasin dah kenyang, the elders went inside to 'talk'.. with us terpakse tagging along la kan.. dengar je laaa..
Then we sorta 'pakse' Ana and Mama to take the picture for the 'sarung cincin'. Balik tu, Ana kasik suprais yg bes.. ape ye? 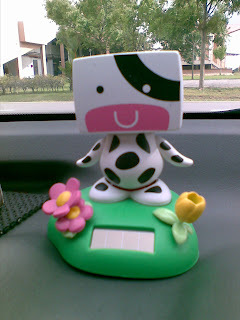 Saturday saw us picking up Izati from UIA before we went to pick up Adi for his 'meminang' business. Guess what she gave me? 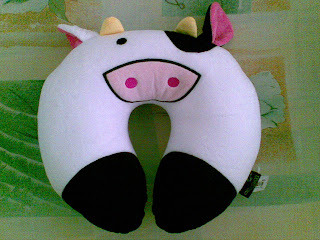 Heheh..
Yeay, tambahan collection for my Lembu hehe.. 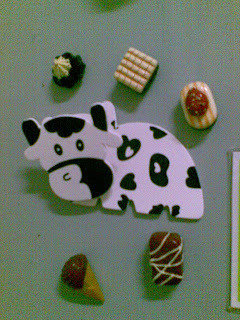 Though the fridge magnet Lembu wasn't my favourite black-and-white Lembu New Zealand and only a typical brown Lembu Malaysia.. but its the thought that her sister loves Lembu that counts hehe..
We went for this site visit on the 8th of April 2009 and mostly were postgraduates and ROs. Leong was the only lecturer who went with us, thus making her the 'guru pengiring' after we realized NO LECTURER was assigned to be our chaperone.. sabo je lah! Since most of us were from different branches of Civil Engineering, we didn't quite know what to expect and whether the trip was relevant or not in our field. I guess the real reason most of us went was because we were kinda sick of our research (hahah..) and wanted to do something different for a change. We went by the USM bus and arrived at the site near Bukit Merah around 9.30am. This sign greeted us..
Then we were ushered into this room in the site office for some briefing. Bleh tak budak² USM ni sempat je bergambo dlm bilik tu. Kelihatan senyuman lebo dari Fahmi and Dayah sementara waiting for the person-in-charge to start..
Actually byk lagi gambo during this briefing tp sy malas nak kecikkan semua. Then here's us during the tea break after the briefing. Sy sgt berkenan melihat karipap pusing dan hampir tamak mengambil 2 bijik. Sib baik tak amik.. masin! Dan lihat lah budak² USM ni, sempat lagi posing dlm make-shift bilik jamuan itu.. tsk.. tsk.. This is a group photo of us right after we had our break. Saje poyo je sumer taking the picture in front of the site office before we went for the site visit. During the bus ride, me, kak Win and Leong talked about our Latihan Industri (LI) being the first and last time any of us experienced anything on an actual construction site. We all remembered that the white safety helmets were usually for the engineers while the yellow ones were for the workers.. usually la! At that site, the workers were wearing white one.. adehhh! 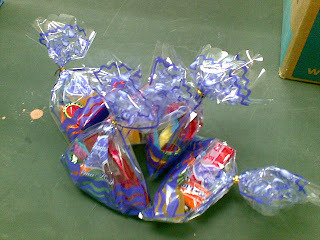 But then we got a nice suprise.. ape ye? Jeng.. jengg..
Apekah itu di dalam kotak? Heheh.. PURPLE (the colour of USM) helmets for visitors hehe.. memasing jadik sedikit jakun sbb tak penah tgk helmet purple haha..
Of course, a new group photo was required la kaaann hehe..
Then we went to visit the site for the marine viaduct. Kene panjat² wooo.. with the sun right up on our heads. Some of us weren't from civil engineering during the degree years so diorg ni mcm cacing kepanasan jek jadi nye hehe.. sian! Tp kat sini pun sempat gak nmpk kamera heheh.. dlm dok panas tuuu..
Waaaaaaaaa.. terase sungguh kerdil kan? W/pun sy sedo sy tak la setinggi mane.. tp banding ngan bendealah utk piling ni, rase cam ketot semacam jek..
Then off we went to the other site near Simpang Lima. Naik bas lagi.. sib baik ade aircon after the heat of the day kat luar tu kan..
Nmpk tak memasing merewang kat atas ni. This is actually the base for the 'landasan' so it should be able to hold both approaches for the tracks. About 12 meters wide and 20km in length kot if I'm not mistaken and the piling was done around 40~60m deep sbb sini tanah sgt la lembut. The type yg suke lecak after rain kan.. so no wonder la. But 40~60m?!?! Giler dalam!!! I'm not from Geotechnical engineering, tp Pn Mas, bukankah itu sgt dalam? Ade la jugak byk gambo taken while the briefing was done but I'll just put the final group photo di kale memasing sedang tahan panas hehe.. This was supposed to be posted before the BBQ as I got it that day. 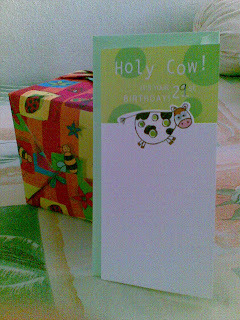 But since we were quite busy right till the end of our BBQ, I didn't have time to update on this..
A day earlier, Wan had YMed me saying I got a parcel and it was on Abg Joe's desk. I took my own sweet time in retrieving it as I was still a bit busy with other things. But then on Friday, while waiting for someone to help out with the food and all other things, I remembered my parcel so I went up to get it.. tadaaa.. 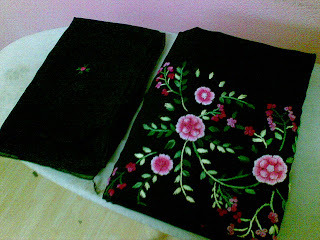 This is the folded view right from the parcel itself..
..and this is the poyo-nak-gantung view heheh..
Now looking at this, I planned to make it for Adi's wedding nanti since it felt so chumel haha.. but then, on second thought, it BLACK! Buat nye org ingt sy berkabung sbb Adi kawen dulu, camne? Hahahah..
Ingt nak update on BBQ last Friday and Adi&Ana semalam.. tp bgn je ade 'hal'..
Hmm.. sumer ade. Mcm la kitorg ni tak bertanggungjawab sgt.. cume rase tak adil bile kitorg dituduh tanpe soal siasat. Kot ye pun, tgk² le punce dulu.. bende² hidup berkaler merah tu dari Jumaat dah ade, dan bukan sbb salah kitorg.. tp tak bes tu sbb lum sempat ape, sumer org dah tau..
Bukan ape.. kitorg maybe excited aritu, bz skit and happy.. tp itu tak bermaksud kitorg lupe tanggungjawab dan janji kitorg.. Bile org buat baik kat kitorg, takkan kitorg nak balas ngan bende buruk kot..
A few years ago, my brother Iskandar who has a nose for 'orphaned' kitties bought back this black and white kitten. Its body was the whitest of whites with the blackest of blacks spots around its body.. just like the 'lembu² New Zealand' advertisement. I'd never seen such vibrant (though mono) colours on a kitty. We called him, M'bu, naturally! 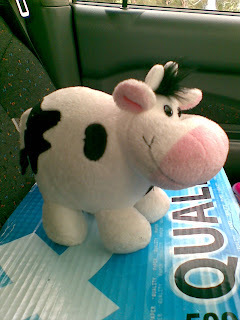 Then a few years later, when Ikram came back from his short stint in Japan, he bought back this cow plushie which reminded me of M'bu (who was deceased by then). 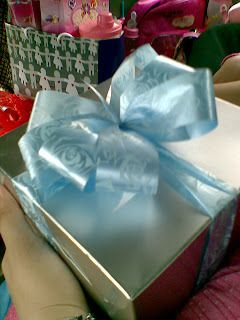 I fell in love with it at sight but Ikram didn't wanna give it to anyone haha.. only Izati got borrowing privilleages! 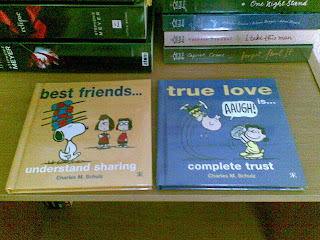 With my 'love' unreturned, I resumed my life until I saw this..
..in a shop near Farah's house! 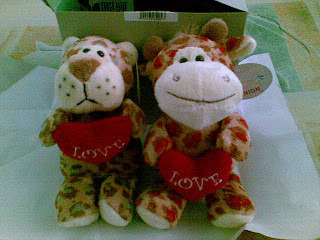 And I fell in love again, but this time, my love was returned haha..
..with Ramlah, pitying the Lembu being single, bought this other one to accompany the first one hehe..
Then a few months ago, at SnJ, I found these storage boxes.. and of course bought one for myself. Why? 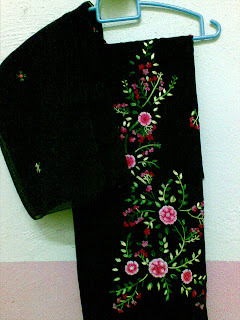 Hehe.. and here's the back view pulak! 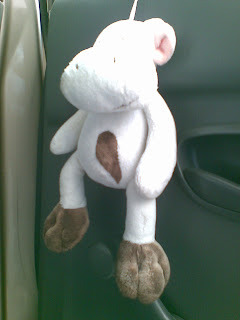 As for another Lembu item in my car.. the newest addition :) Chumel tak? 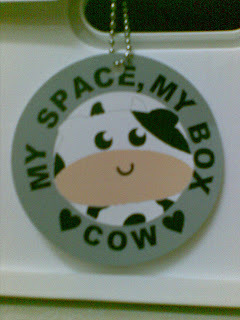 Izati sent me this in an MMS last week.. and I was excited until she told me she didn't buy it pun.. caitt!! So I can just look at the picture je la kan hehe.. Living outta 'nasik' bungkus' hehe..